Background: On 28 June 2004, New York State (NY) became the first jurisdiction to require cigarettes to meet a reduced ignition propensity (RIP) standard. This law resulted in cigarette manufacturers modifying nearly all of their brands sold in NY. However, the same cigarette brands sold in other states were not modified to meet the RIP standard. Objectives: This paper examines relationships between the RIP law and smokers’ awareness of changes in the performance of their cigarettes (that is, going out more frequently, change in taste), and smoking behaviour. Methods: Data for this analysis come from a nationwide survey of 2088 adult smokers (> 18 years of age) conducted in the USA between July and December 2004. 143 of the smokers included in the survey were residents of NY while the remainder were from other states (n = 1945). Survey participants were asked whether their cigarettes “ever go out between puffs” and whether they had noticed any change in the taste of their cigarettes in the past 12 months. Results: NY smokers were three times more likely than smokers in other states to report that their cigarettes often went out between puffs (17.3% v 5.6%). However, NY smokers appeared no more likely to report noticing differences in cigarette taste, an intention to quit smoking, or to have made quit attempts. Conclusions: A significant minority of smokers in NY reported noticing changes in the performance of their cigarettes following the RIP law, as would be expected. However, the RIP law appears to have had no impact on the smoking habits of New Yorkers, countering arguments made by cigarette manufacturers that the law would impact consumer acceptability. The implementation of the RIP law in NY provides a unique opportunity to evaluate the public health impact of government mandated changes in cigarette design. Based on the intent of the law, the findings reported in the Philip Morris memo, and our own understanding of RIP cigarettes, we would expect that: (1) consumers will notice changes in the way their cigarettes smoke; and (2) consumers will respond to the changes by smoking differently, seeking non-RIP cigarettes, or quitting smoking. This paper presents results from a nationwide survey that assessed smokers’ awareness of changes in the performance of their cigarettes (that is, going out more frequently, change in taste), and smoking behaviours. Data analysed in this paper came from the third wave of the International Tobacco Control Four Country Survey (ITC-4). A detailed description of ITC-4 study can be found elsewhere (http://www.itcproject.org). Briefly, ITC-4 is a prospective cohort study designed to evaluate the psychosocial and behavioural impacts of key national level tobacco control policies enacted in Australia, Canada, the UK, and the USA. All aspects of the study protocol and survey measures are standardised across the four countries. The wave 3 survey was conducted between July and December 2004. There were two components in the wave 3 survey—a follow up survey conducted among subjects who completed the wave 2 survey (of these, some had completed the wave 1 survey while others had been recruited at wave 2), and a replenishment survey conducted at wave 3 to replace respondents lost to attrition. Sampling procedures and calling protocol for replenishments are identical to those at wave 1 recruitment. In all four countries, a total of 5827 subjects completed the follow up survey and 2550 subjects completed the replenishment survey. Subjects included in this study are current smokers in the US component of the wave 3 survey, including both cohort and replenishment participants (n = 2088; 1199 cohort and 889 replenishment, including 143 New Yorkers). Because the RIP items were added for wave 3, there was no reason to suspect cohort or replenishment participants would respond differently (that is, because of previous experience with the items among the cohort participants), so they are analysed together. The protocol was approved by the Roswell Park Cancer Institute institutional review board. Data on participant age, race/ethnicity, education level, income, state of residence, and cigarette smoked per day are summarised in table 1. All smokers were asked whether they had made any attempts to quit smoking in the last 12 months. Two items were used to assess respondents’ awareness of RIP related design changes. First, participants were asked whether their cigarettes “ever go out between puffs”. If respondents answered “yes” they were asked whether their cigarette went out “rarely”, “sometimes”, or “often”. Second, consumer awareness of RIP related changes was measured by asking: “During the past 12 months, have you noticed any changes to the cigarettes you usually smoke, such as in how they taste? (Y/N).” Participants also reported their current cigarette brand, which was recorded verbatim. Brands were then classified according to manufacturer (Philip Morris, Reynolds-American, Lorillard, others) to assess whether smokers of brands made by specific manufacturers were more likely to report changes in self extinguishment and/or taste. Brand manufacturer was chosen over brand on the presumption that manufacturers would use the same compliance technology across their brands, but that these technologies might differ among manufacturers. Brands were also coded as full flavour, light, ultra light, or “other strength”, based on the descriptors reported by participants in order to assess whether the likelihood of reporting changes was associated with specific types of cigarettes. Finally, to assess differences in smoking patterns that could be related to the design changes introduced in NY, participants were asked “How long do you wait in between puffs?” Responses were classified into four categories: 1–15 seconds, 16–30 seconds, 31–60 seconds, and more than 60 seconds. Data were analysed using frequency tables and cross tabulation with χ2 tests in SPSS 13.0 (SPSS Inc, Chicago, Illinois). Analyses were performed on unweighted data. Table 1 outlines cross tabulations done separately for NY smokers and smokers in the rest of the USA for the variables of interest, as well as overall results. Smokers in NY were significantly more likely than smokers in other states to report that their cigarettes went out in between puffs (p < 0.002). 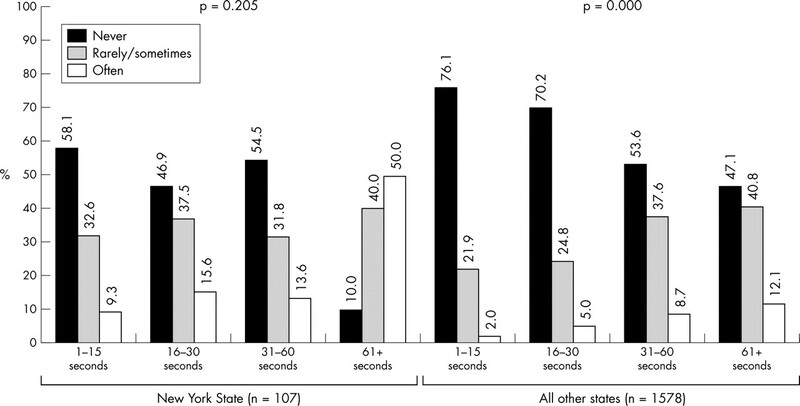 Figure 1 shows the distribution of responses: 17% of NY smokers versus 5.6% of “other state” smokers reported their cigarettes “often” went out between puffs. Because RIP cigarettes are specifically designed to self extinguish when left unattended, we were not surprised that the effect is strongest among those who reported delaying longer between puffs on their cigarettes (fig 2). NY smokers who let the cigarette burn for 60 seconds or longer between puffs were most likely to report their cigarettes went out; the association, although weaker, was noted among smokers in other states as well. We assessed whether NY smokers were more likely than smokers in other states to report shorter durations between puffs and found no evidence for a difference (p = 0.97). Percentage of smokers within New York State, compared with smokers within all other states, who report that their cigarettes never go out, rarely go out, sometimes go out, or often go out between puffs. Percentage of smokers within New York State, compared with smokers within all other states, reporting that their cigarettes never go out, rarely/sometimes go out, or often go out between puffs, examined by reported duration between puffs. Among NY smokers, those who smoked brands made by smaller manufacturers were more likely than smokers of brands manufactured by larger companies to report their cigarettes went out often. In addition, NY smokers of ultra light brands were about twice as likely as NY smokers of regular, light, or other strength cigarettes to report their cigarettes went out often between puffs—this did not appear to differ by cigarettes per day or manufacturer. Most smokers, both in NY and in the rest of the USA, reported not noticing a change in the taste of their usual brand. Smokers in NY did not appear significantly more likely than smokers in other states to report noticing a change, though a trend was present (21.4% v 15.4%, p = 0.154). Among NY smokers who reported their cigarettes going out often, 38.9% reported a change in taste compared to 16.9% who reported their cigarettes went out never, rarely, or sometimes between puffs (p = 0.06). The same pattern was seen in smokers in the rest of the USA (25.8% v 14.9%, p = 0.03). There was no significant difference in the proportion of NY smokers who made a quit attempt in the past 12 months, versus smokers from other states (40.0% v 39.0%, p = 0.85). This did not differ when the analysis was restricted to those NY smokers who noticed self extinguishing (37.5% v 26.3%, p = 0.516). Similarly, intentions to quit did not appear to differ between NY and other state smokers (63.6% v 63.1%, p = 0.40). However, among NY smokers who said their cigarettes go out often, 95.0% reported intending to quit smoking, compared to 65.7% of those who reported their cigarettes going out less frequently (p = 0.02). This relationship was not observed among smokers in other states (62.4% v 68.8%, p = 0.40). Independent tests conducted by Connolly and colleagues12 after the implementation of the NY law found that NY cigarettes were far more likely to self extinguish using the ASTM method than the same brands purchased in California and Massachusetts. Whether these design changes lead to a reduction in fires is an open question that can be resolved only when fire incident data from a database such as the National Fire Incident Reporting System (NFIRS) are available in NY and comparison states. However, early reports for 2004 suggest that fire deaths dropped from pre- to post-implementation.19 It appears from the present data that the introduction of RIP cigarettes has not led to changes in cigarette burn properties that most consumers will notice. Indeed, only 17% of NY smokers noticed that their cigarettes “often” go out. In terms of consumer acceptability, it appears that most NY smokers did not notice a taste difference in their usual brand at a level different from smokers in other states. In contrast to public statements from the tobacco industry,16–18 these findings suggest that RIP regulations do not appear to have an adverse impact on consumer acceptability. Further, Connolly and colleagues12 have shown no change in tax receipts in NY after implementation of the law, suggesting no change in buying patterns or consumption. The majority of smokers in NY reported not noticing the self extinguishing feature or changes in taste, suggesting that the technology can be seamlessly integrated without appreciable consumer backlash. While we saw no increase in quit attempts among NY smokers, even among those who reported their cigarettes going out often, we did note a substantial difference in self reported intention to quit smoking. Smokers in NY who reported their cigarettes often went out between puffs had nearly seven times the odds of reporting an intention to quit. Whether these reported intentions are followed by bona fide quit attempts is not clear. It is possible that smokers who intend to quit may be more attentive to inconvenient or negative aspects of their smoking, such as having to re-light their cigarettes more frequently. In summary, the data from this study show that smokers in NY were more likely than smokers in other states to report their cigarettes went out often between puffs. While NY smokers were more likely to say that their cigarettes self extinguish more readily than smokers in other states, most NY smokers did not report a change in taste. Those who did notice their cigarettes going out more often were more likely to report an intention to quit smoking, but no difference in quit attempts over the past 12 months was observed. It seems that smokers in NY have adjusted to the modified cigarettes and the modification has not impacted how smokers rate the taste of their cigarette or impacted cigarette consumption, as had been predicted by opponents of the RIP law. It is still too early to tell if the modified cigarettes have reduced cigarette-caused fires, although one would anticipate such a benefit given the data by Connolly et al12 demonstrating the reduced ignition propensity of the modified cigarettes. What is clear is that consumers have not rejected the modified cigarettes, countering arguments made by cigarette manufacturers that the law would impact consumer acceptability. On 28 June 2004, New York State became the first jurisdiction in the world to implement a law requiring cigarettes to meet a reduced ignition propensity (RIP) standard. This law resulted in cigarette manufacturers modifying nearly all of their cigarette brands sold in New York State to meet the RIP standard. However, the same cigarette brands sold in other states were not modified to meet the RIP standard, providing a natural experiment to observe how smokers responded to the modified cigarettes. Results from a survey comparing the responses of adult smokers from New York State and outside New York revealed that smokers in New York were three times more likely than smokers in other states to report that their cigarettes often went out between puffs, as would be expected given the RIP standard. The RIP law appears to have had no discernable impact on how smokers perceive the taste of their cigarettes, smoking behaviour, and intentions to quit, countering arguments made by cigarette manufacturers that the law would have a negative impact on consumer acceptability. Hall JR. The smoking-material fire problem. Quincy, Massachusetts: Fire Analysis and Research Division, National Fire Protection Association, 2003. Leistikow BN, Martin DC, Milano CE. Fire injuries, disasters, and costs from cigarettes and cigarette lights: a global view. Prev Med2000;31:91–9. Chapman S, Balmain A. Time to legislate for fire-safe cigarettes in Australia. Med J Australia2004;181:292–3. Anon. Fire safety standards for cigarettes. ID No. DOS-53-02-00018-RP. NYS Register, 3 September 2003. McGuire A. How the tobacco industry continues to keep the home fires burning. Tob Control1999;8:67–9. ASTM International. Standard test method for measuring the ignition strength of cigarettes. E2187-02. West Conshohocken, Pennsylvania: ASTM International, 2002. Anon. Canada passes bill requiring ignition-propensity standard. Tobacco Reporter. 2004 July :14. Associated Press. Douglas signs bill for fire-safe cigarettes. Brattleboro Reformer. 2005 June 22. Technical Study Group. Toward a less fire-prone cigarette. Final report of the Technical Study Group on cigarette and little cigar fire safety. Consumer Product Safety Commission, Washington, DC 1987. Mitler HE, Walton GN. Modeling the ignition of soft furnishings by a cigarette. National Institute of Standards and Technology, US Department of Commerce, Washington DC. NIST Special Publication 852 1993. Ohlemiller TJ, Villa KM, Braun E, et al.Test methods for quantifying the propensity of cigarettes to ignite soft furnishings. National Institute of Standards and Technology, US Department of Commerce, Washington DC. NIST Special Publication 851 1993. Connolly GN, Alpert HR, Rees V, et al. The effect of the New York State cigarette fire safety standard on ignition propensity, smoke toxicity and the consumer market. Tob Control2005;14:321–7. Gunja M, Ferris Wayne G, Landman A, et al. The case for fire safe cigarettes made through industry documents. Tob Control2002;11:346–53. Gear J. Initial adult consumer testing to support banded paper advertising claims. Philip Morris USA. http://www.pmdocs.com (Bates No. 2078187805) 2000. Warwick WR. Consumer contacts concerning Merit-banded paper. Philip Morris USA. http://www.pmdocs.com (Bates No. 2078190899) 2000. Imperial Tobacco Canada Limited. A submission presented on behalf of Imperial Tobacco Canada to Health Canada and the Standing Committee on Health in consideration of the regulatory proposal for reducing fire risks from cigarettes and Bill C-260, An Act to Amend the Hazardous Products Act (fire-safe cigarettes) 2003.
RJ Reynolds Tobacco Company. Comments to proposed rulemaking, Fire Safety Standards for Cigarettes. RJ Reynolds. http://tobaccodocuments.org (Bates No. 528767372) 2003. Hawkins MR. Comments of Philip Morris USA Inc. (“PM USA”) on the proposed new York fire safety standards for cigarettes (to add new Part 429 to Title 19 NY Comp Codes R & Regs). Philip Morris USA. http://tobaccodocuments.org (Bates No. 528767429) 2003. Precious T. Smoking-related fire deaths drop with sale of safer cigarettes. The Buffalo News. 2005, Sept 20. ↵* Retailers and wholesalers had six months to sell remaining stocks that were not certified to meet the standard. This work was supported by the Roswell Park Cancer Institute Transdisciplinary Tobacco Use Research Center (1 P50 CA111236). Competing interests: The authors have no competing interests to report.